My love for Lush products lasts a long time but until recently it was limited to their body and bath products. My mistake, because although some of their bubble bars are heavenly they are not their best products. At least not in my book. Not that I don't like them (one of them will get its own post) it is just the fact that they are really expensive since you get 2-3 baths with 1 bar depending on the size of it and they cost from 2.50-4.15 GBP for 100g/ from 5.95-10.95$ per bar/ 4.95-8.95 Euros per bar. During Lent I banned myself from eating chocolate. It was still cold so while visiting a Lush store I picked up an amazing smell of chocolate that was calling me... 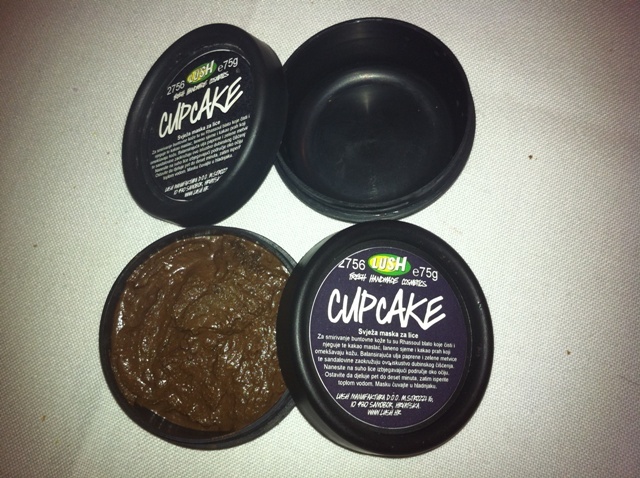 It was Cupcake mask. The ingredients and her cleansing atributes made sure that I buy it (glad I did). I am posting pictures below and I know that it looks funny but it is great for the face. LUSH Croatia advertises this mask as a combination of chocolate smell and fresh ingredients which will take you beyond your imagination. 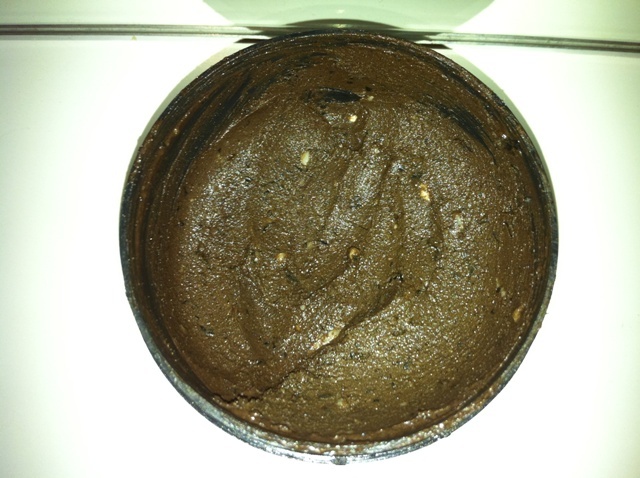 Rhassoul mud is therapeutical and antiseptic which will help your skin to get deep cleaned. Cocoa butter will soften your skin and bring her back the moisture, spearmint oil will shrink your pores and sooth your skin leaving it less sensitive. It is an ideal treat for both young and old skin with break out problems not caring if you are 9 or 99. But I also read some information about this mask on their UK and USA sites and it seems to me that they target this mask more to teenagers. I am not a teenager and I don't have acnes or really bad break outs. I get a pimple or two sometimes if it is that time of the month, but I bought this for cleansing purposes. INGREDIENTS: Rhassoul Mud, Linseed Infusion, Glycerine, Talc, Cocoa Powder, Cocoa Butter, Fresh Mint, Sandalwood Oil, Vanilla Absolute, Spearmint Oil, Peppermint Oil, Limonene, Perfume. The mask should be applied on dry face, left for 5-10 minutes and then rinsed off with warm water. Since it is made from natural ingredients it is best to keep it in the fridge. I loved this mask so much that I got another one. Proof below :). As I said, I am not a teenager and I don't have acne problems but I have to keep my pores under control because I have oily skin. I fell in love with the chocolate sent and it really did calm down all the redness that I had during that time of the month. When you take off this mask your face feels so clean and hydrated you won't belive it. I will definitely repurchase this product and would recommend it to all people with any skin problems (smaller redish break outs or acnes). I am going through my second container of this mask so I'll take a break when I use it up (just because I think it is better to rotate some products to keep your skin wondering what will happen next). This mask conviced me to buy another masks from Lush and they were all amazing!!! Reviews will come... Just a little preview. As for the price, you will get 75g of product for 5.75 GBP/12 $/9 Euros. At Lush they will tell you that you'll get 7-8 applications from that, I get 8, and I am not saving it when I apply it. Since it is made from fresh ingredients its expiration date is sooner than in other cosmetic products so use it frequently (once or twice a week, depending on your skin type). Most of Lush shops don't sell it online because it can go bad. Also, most Lush shops will give you a free new mask if you bring 3 empty containers. I am not sure how that works around the world so check it with your local store. 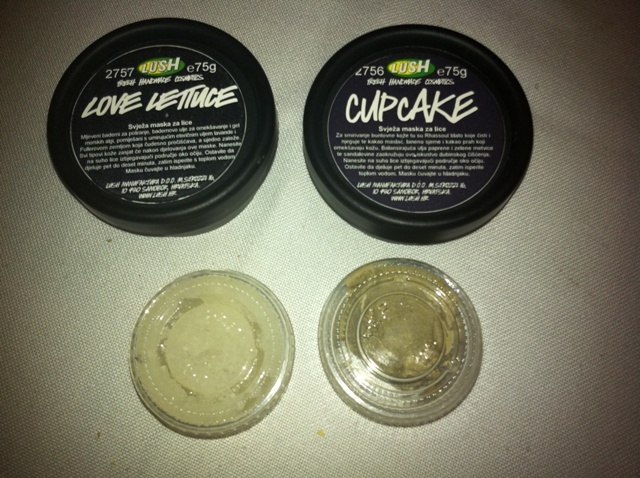 Lush is eco friendly so they recycle their containers. What about you? Have you tried this mask? Will you buy it? 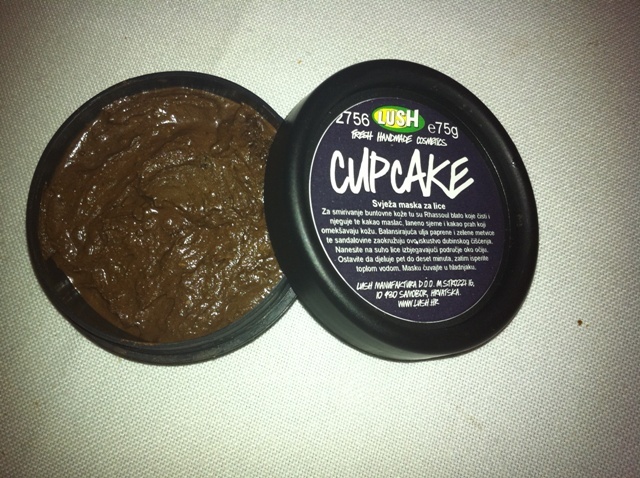 Do you have any other Lush masks? Do you like them?